Bounded by the Owenavorragh River on the north side and the canal on the seaward side to the east, Courtown Woodland dates back to pre-Famine times. At 25 hectares, it was once home to oak and ash trees. Acquired by the State in the late 1950s, it was planted with commercial timber. The mixed conifers – broadleaf plantings – were largely of spruce with some ash although small strands of oak remain together with avenues of chestnut and lime trees. The canal was constructed under a Famine relief scheme in 1847 and, as you choose your walk along the River Walk, Top Walk, Canal Walk or High Cross Walk, you are following in the footsteps of the previous Lords and Ladies of Courtown and their visitors. Keep an eye out for remaining trees from the fifth Earl’s conifer collection, including Californian redwood, swamp cypress, Japanese cedar, cedar of Lebanon and a number of pine, yew and true cypresses. You will also notice common oak, ash, sycamore whilst, unfortunately, English Elm dating from the 1840s have mostly succumbed to Dutch Elm disease and are now suckering remnants of once fine, pre-Famine trees. 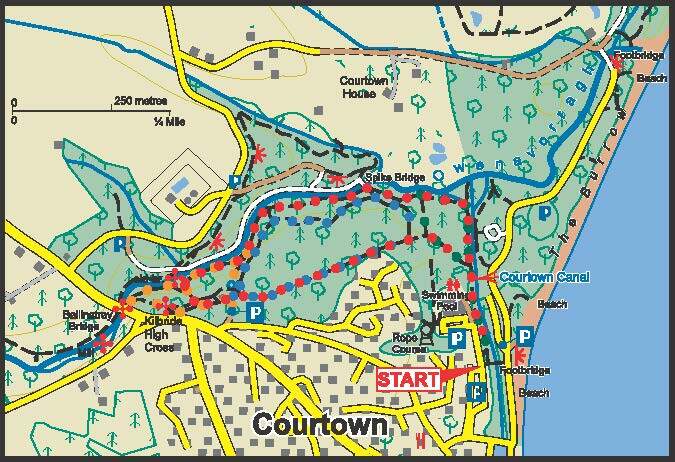 A beautiful woodland area offering a cool green respite from the sunshine and sea in Courtown, these walks, with a tree-lined avenue, offer a glimpse of the past and a chance to recover from today’s busy schedules while smelling the wild garlic! The 2.5m high High Cross of Kilbride, the sole reminder of an early Christian church in the area. Ballinatray Bridge, once amongst the tallest viaducts in Ireland. A yew tree planted in the 1870s, felled many years ago, continues to grow adjacent to the River Walk. Late spring’s spectacular white carpet of wild garlic blossom covering the woodland floor, followed by a delicate show of bluebells. Courtown Adventure and Leisure Centre – Family-orientated centre with something for every age group: climbing wall, aerial trekking, zip wire, abseiling, quick jump, archery, laser tag, junior gravity, junior playground, 3 pools, 2 slides and gym. Seal Rescue Ireland, located on the grounds of Courtown Leisure Centre.